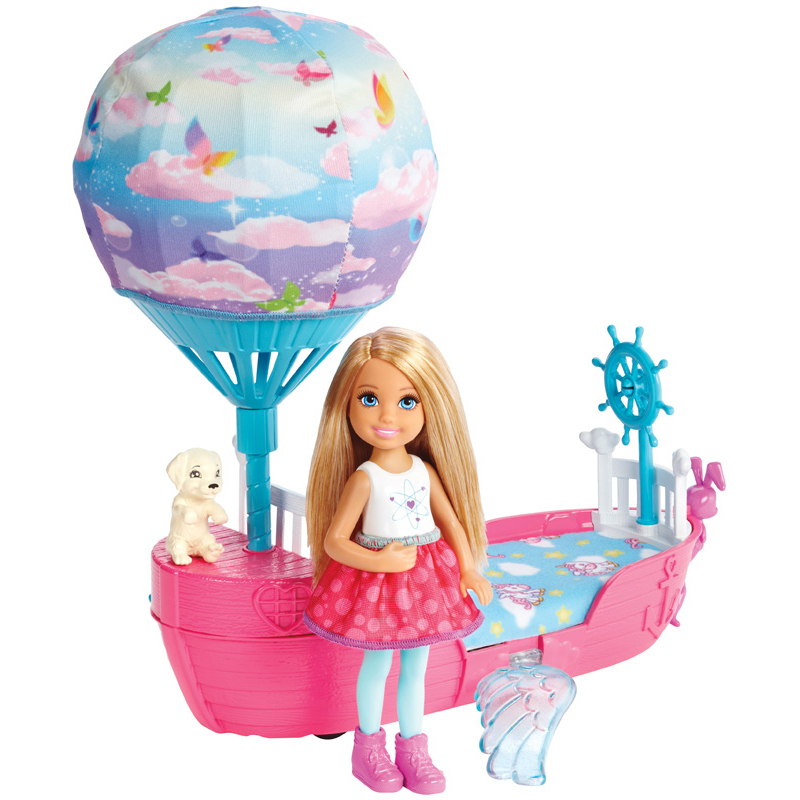 Join Chelsea™ doll for a magical ride in her Barbie™ Dreamtopia Magical Dreamboat and let your imagination soar to your favorite kingdoms! 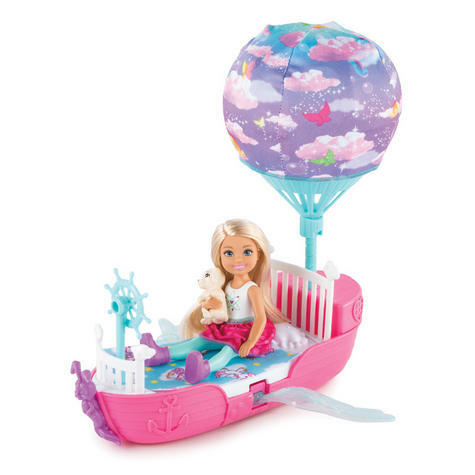 This is the perfect vehicle for exploring Dreamtopia - the bed that turns into a “flying” boat has so many sweet-as-can-be surprises! Roll the vehicle forward on its hidden wheels to see the wings flap and the hot air balloon spin. 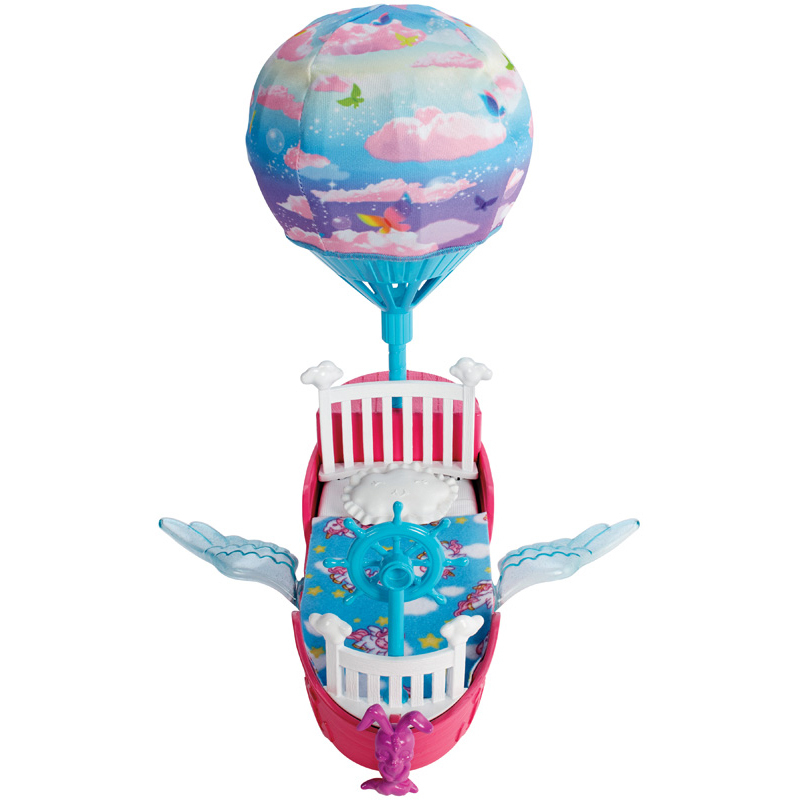 With pink clouds, bright colors and butterflies, this balloon is dreamy to watch again and again. Let Chelsea™ doll “steer” at the ship’s wheel or have sweet dreams under the blanket as you lead the way; there’s even an attached pillow for Chelsea™ doll. She’s ready to watch her dreams come to life wearing a colorful dress and purple sneakers. And she has an adorable puppy as a companion to share in the fun and add possibilities to play! 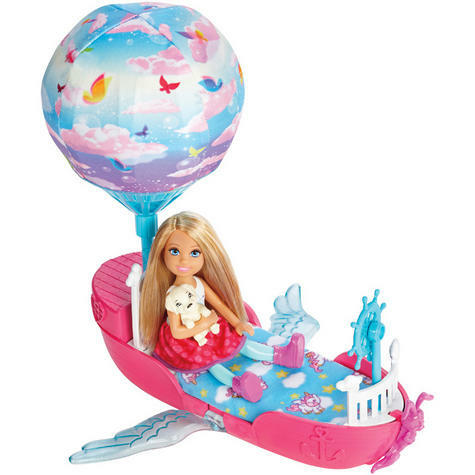 With dreamy touches and sweet details, this Barbie™ Dreamtopia Magical Dreamboat can go anywhere your imagination takes you. 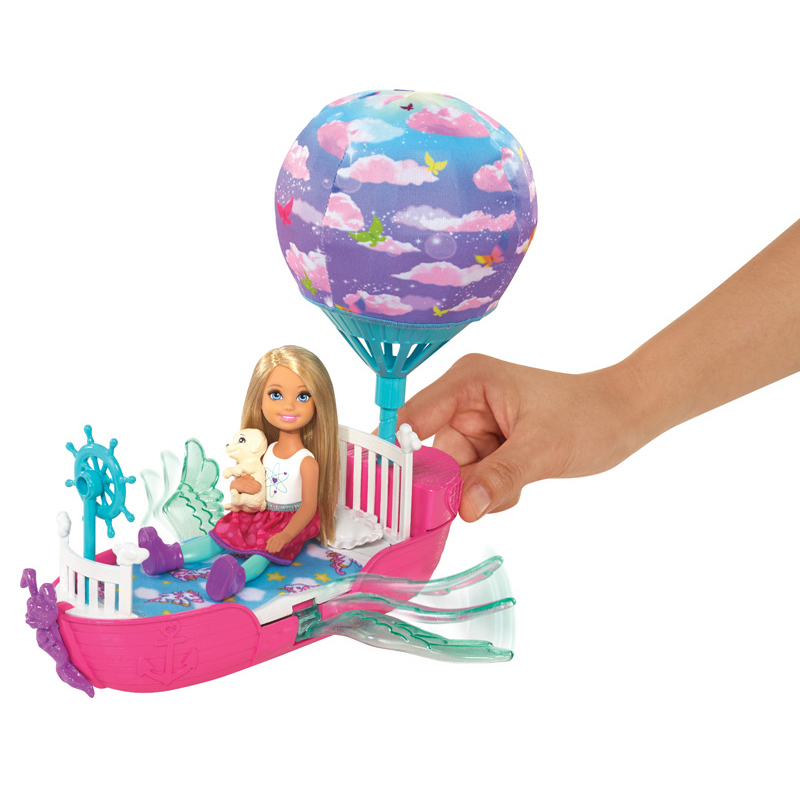 Young dreamers will love exploring new worlds and dreamy stories with the Barbie™ Dreamtopia Magical Dreamboat. Collect all of the Barbie™ Dreamtopia dolls and accessories and let your dreams take flight (each sold separately, subject to availability). Includes Chelsea™ doll wearing fashion and accessories, the vehicle with moving wings and balloon, puppy friend and blanket. Colours and decorations may vary. 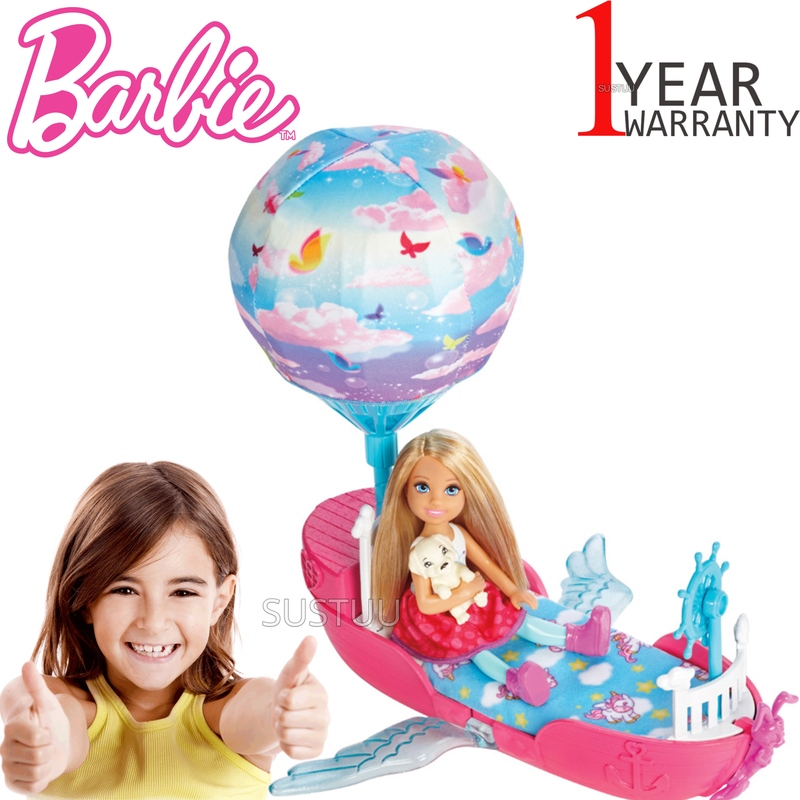 Take Chelsea™ doll and her puppy on the adventureof a lifetime - or a nighttime - with her Barbie™ Dreamtopiavehicle! The bed that turns into a boat has lots of sweet-as-can-besurprises: roll the vehicle forward on its hidden wheels to see thewings flap and the hot air balloon spin. Chelsea™ doll can “steer” atthe ship’s wheel, get cozy under the blanket and sleep sweetdreams upon the attached pillow. Chelsea™ doll looks adorable wearing a colorfuldress and purple sneakers. With dreamy touches and sweet details - like thesky-coloured balloon decorated with pink clouds, bright colors andbutterflies and the purple mermaid figurehead - this Barbie™Dreamtopia Magical Dreamboat can go anywhere your imagination takes you. 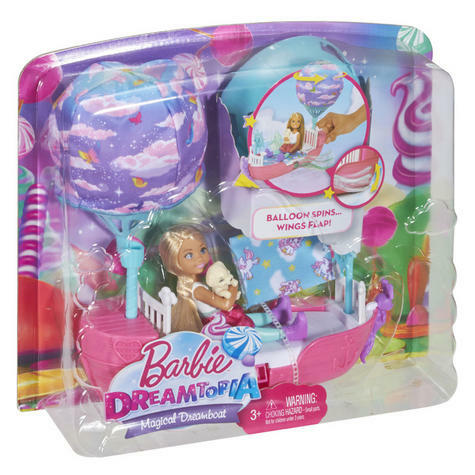 Collect all of the Barbie™ Dreamtopia dolls andaccessories and let your imagination take flight because when you enterDreamtopia with sisters Barbie® and Chelsea™, youwake up to a world where dreams become reality!